Have you started your spring cleaning and are finding a lot of old use shoes you do not need? If you have then that’s great! Because here at EVPC our Young Adults Ministry has partnered up with Funds2Org to help those trying to earn a living for their families in other Countries around the world. 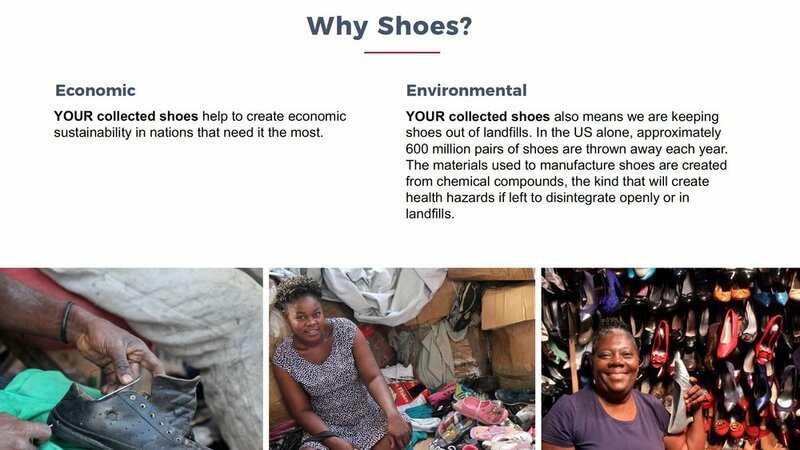 All the shoes donated from you will be redistributed throughout our Funds2Orgs network of microenterprise partners in over 24 developing nations, countries such as Haiti, Honduras and other nations in Central America and Africa. Funds2Orgs has developed a training curriculum that our partners in these countries use to help train impoverished people to start, maintain and grow their own businesses. Their proceeds from their shoe sales in their local marketplace or bazaar are used just like we use our wages: to feed, clothe and house their families. By definition, micro enterprises are small businesses with minimal employees and minimal capital. In a developing country, necessity compels micro entrepreneurs to represent the vast majority of the small business sector. Due to a lack of formal jobs and training available to the poor, micro-enterprises add value to the economy by creating micro business, enhancing income, and lowering the overall cost of business. Micro-enterprises in developing countries allows impoverished people to start and maintain their own businesses. Most of these small businesses come in the form of local farms, selling cooked food from the sidewalk or food staples from a small store as well as basic living necessities including repurposed shoes and clothing. By simply dropping off your shoes at our drop-off station located at East Valley Pentecostal Church every Wednesday @7pm or Sunday @11am. Let us know when you plan to drop off. Getting assistance if you need help getting your donations to the drop off location. Or getting answers for any questions you may have.